Hello and welcome to Sylvania Outfitters, Inc! I'm Bob Zelinski and I have operated Sylvania Outfitters for over forty years. We are conveniently located just one mile west of Watersmeet, MI on US Hwy 2, and are open 7 days a week with summer hours from 8 AM to 8 PM, spring/fall hours from 8:30 AM to 6 PM, and winter hours from 10 AM to 5PM. We are always happy to help you with all of your canoeing, kayaking and camping plans! Please note that it is best to make a reservation for your outfitting equipment before you arrive, especially if you have a large group. Sylvania Outfitters' expertise is supplying you with provisions and supplies for all of your outdoor camping, canoeing, cross-country skiing and trekking adventures. We also carry fishing licenses, lures and maps, as well as freeze-dried foods. Your customized outfitting will ensure that your outdoor adventure experience goes off without a hitch, allowing you to enjoy the beautiful Sylvania Wilderness. For more information on the outfitting process, please watch this video by Scott Cherek describing the steps of customizing your gear. Additionally, Sylvania Outfitters, Inc. is the only outfitter permitted by the US Forest Service to provide canoe trips into the Sylvania Wilderness and the surrounding Ottawa National Forest. Very occasionally we have customers that rent and take our canoes for Isle Royale trips, for more information on this please give us a call. You'll love our diverse selection of canoes, kayaks and rowboats: whether you're planning a simple day trip or an extended excursion, we'll provide most everything you need and deliver it to your drop point. Check out our new waterproof map of the Sylvania Wilderness and Recreation Area! 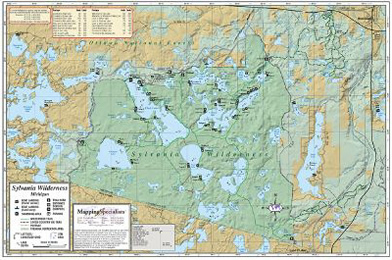 This 17.5 x 11.5 map is a must have for your excursion through the Sylvania Wilderness. Available for only $7.00, which includes postage and tax! Call us at 906-358-4766 for more information on ordering this or any of our other maps. 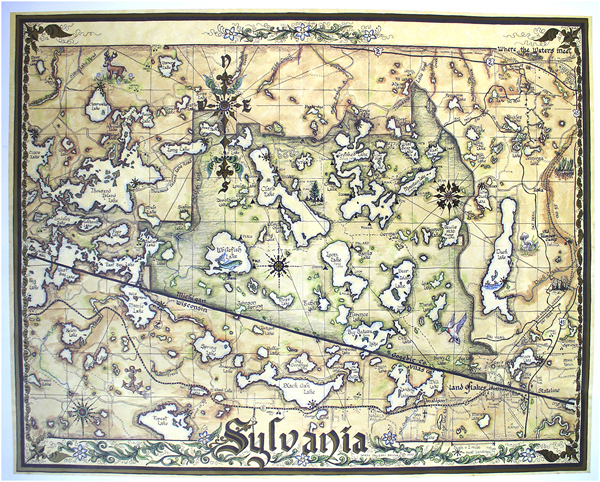 Also check out the many other maps we have available, including this beautiful hand-drawn Sylvania map, pictured right!